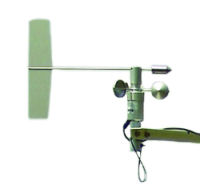 The 034B-QD, manufactured by Met One, combines a three-cup anemometer and vane into a single integrated package to measure wind speed and direction. This wind set is constructed out of lightweight aluminum and is designed for continuous, long-term operation for your applications. For this version of the 034B Wind Set, the cable terminates in a military style connector (instead of pigtails) and is the ideal length for attachment to a RAWS-F Fire Weather Quick Deployment Station. The 034B-QD monitors wind speed using a three-cup anemometer that contains a sealed magnetic reed switch. Rotation of the cup wheel produces a pulse that is directly proportional to wind speed. The frequency of the pulse is measured by the data logger pulse count channel, then converted to engineering units (mph, m/s, knots). Wind direction is sensed with a potentiometer. With the precision excitation voltage from the data logger applied to the potentiometer element, the output signal is an analog voltage that is directly proportional to the azimuth of the wind direction. The connector attaches to the RAWS-F Fire Weather Quick Deployment Station, which has an on-board CR1000. If a sensor automatically ships with a calibration sheet, what information is included on it? The information included on a calibration sheet differs with each sensor. For some sensors, the sheet contains coefficients necessary to program a data logger. For other sensors, the calibration sheet is a pass/fail report. If the calibration sheet contains coefficient information, Campbell Scientific keeps a copy, and a replacement copy can be requested. If the calibration sheet does not contain coefficients, Campbell Scientific does not keep a copy. It may be possible to contact the original manufacturer for a replacement copy.